How are house slots affected by buying furnished vs unfurnished?? I am not good at decorating! If I buy a furnished house does it decrease how may slots I have to add my own stuff?? It's just regular furniture in the house and all the pieces will count towards the cap. You can remove any pieces you don't want and it will release space. Since all the houses have to be under the slot cap for players without ESO+, you can count on being able to add the other half if you do have the subscription (which doubles the limit). I bought the Flaming Nix Deluxe Garret furnished. 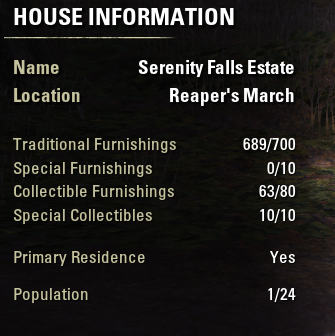 Can the furnishings from that "staple" house be moved to an unfurnished "classic" home (Sleek Creek House)?? Yes. In some houses I am using various items from other houses I bought furnished. My Flaming Nix Garret shows (EHT) 51/100 slots filled. I tried to add a storage chest but can't because it exceeds my "collectible" limit. So what is my collectible limit? Is that the same as trophies? Where does the count show up in the housing editor? Special Collectible limit for Inn rooms is 2 if I recall correctly. Storage chests, mounts, pets and assistants like the banker and merchant count as special collectibles. Trophies are Collectible Furnishings. I can't believe I missed that! It is in the "browse" screen, on the left side. I was so focused on the list box on the right that I completely missed it! I am sure I will be back with more newbie questions. Note that storage chests are actually collectible furnishings and not special collectibles. I have both assistants out in my Flaming Nix, as well as two storage chests (this is with ESO+). Special collectibles are assistants, pets, mounts. Collectible furnishings are storage chests/coffers, monster trophies/busts, and other furnishings such as the Vvardenfell map obtained from a quest in Morrowind, or the ESO+ free statuettes.